So Amelia's latest activity is cheer-leading. I think this might actually be her "thing" as she gets to dance around, memorize stuff, yell and do cartwheels. So far we've tried ballet, she liked it for a while but got bored eventually; gymnastics, I don't think she was quite ready for that one, and then we moved; and soccer, she liked the idea of it, and the practices, but lost interest really quickly at the games. But now she's started cheer leading and so far she loves it. She was the only one in her class to go home last week and memorize their whole cheer, so she got to pick a prize from the goody box this week. This might be a sport where being the smallest kid might come in handy. 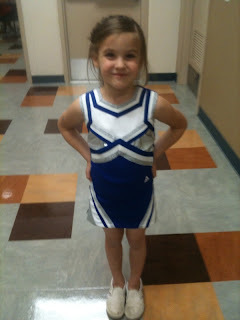 We ordered uniforms tonight, and we had to get her the smallest size. They don't even make a practice uniform small enough for her, she was really sad about that. So yeah, that's what's new in Amelia's world. Anthony is working on potty training. Okay really, I'm working on potty training. Anthony loves wearing underwear, can stay dry all night, and will stay dry most of the day. The problem is the boy will not go #2 in the toilet. It's been about a month of this battle and me cleaning poop out of clothes a few times a day. So I'm thinking I might give up. I'm just so sick of cleaning up poop. Any of you Mamas out there have any advice? He hides to go #2, he doesn't got at a consistent time each day and if I catch him going and move him to the bathroom, he'll stop going and wait an hour and go in his pants again. So frustrating. On the plus side his speech has improved drastically. There are still about 10 sounds that he doesn't say, but he's still come really far. I think he's old enough now that they'll consider speech therapy for him. Very cute! Those times are so fun and they fly right by!